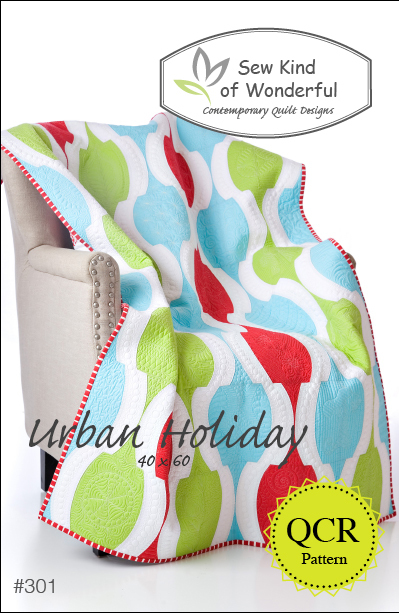 For the Blogger's Quilt Festival, I wanted to share my "Urban Holiday" quilt or my "Crazy Quilt". I literally went crazy when quilting this quilt up. I designed and pieced this quilt a year ago and finally got around to quilting it up and writing up a pattern for it. I just finished it a couple of weeks ago. You could say I went a little overboard for the quilting, but the idea was to quilt each block as if it were an ornament and that's what I did. The whole time I was quilting this, my mind kept telling me I was "Crazy"! I do love how it turned out though and I had a blast quilting it up and trying to come up with different ornament ideas. You can see each individual ornament on my original post here. I'm also happy to say the pattern is available here and just in time for the Holidays! Thanks for putting this Festival on Amy, it's always so much fun to look through everyone's amazing quilts, thanks to all your hard work!